Big Kahuna Words Game Review - Download and Play Free Version! Travel back to the Islands and explore Underwater realms in this brilliant game of word creation. Helpful tutorial levels explain the game well. 100 levels to take on. Unique multiplayer mode which allows you to compete with or against friends. Spelling leads to rewards of both 'wild cards' and unlockable fishes. Hints to help you find words. Aquarium just exists and is not interactive. Switching letters can be confusing and non-responsive. Travel back to the Islands in this brilliant word game of adventure! 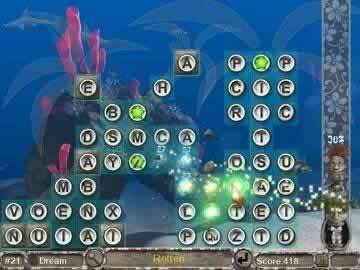 The makers of the very popular Big Kahuna Reef have done it again with this undersea word game. Dive between the Hammerhead Sharks and other aquatic life, breaking stone blocks with your words in an explosive twist on puzzle game play. Explore an almost infinite number of underwater realms with the levels online to download and included level editor. Unlock all the beautiful fish for your own virtual reef! Discover the might of the Tiki Totem and earn rewards for your word-creation prowess in either Action or Relaxed play. Download and explore the word-making journey of a lifetime! 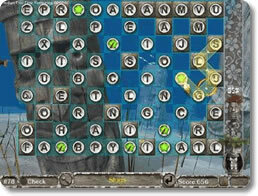 Big Kahuna is a fun word game that has you underwater arranging letters on a grid to form words. In the game, like other games in the genre, you construct words of three letters or greater by connecting adjacent letters. Your successes hinge on the size of the words you create, the rarity of the letters you use, and the speed at which you make the words. Longer words increase your score and provide you with “wild cards” and “wild card bombs” which are substitutes for any letter and “blow-up” neighboring letters. Big Kahuna starts with a helpful tutorial that explains the ins and outs of the game. The tutorial takes place in the first three levels (one hundred in total) and explains how to create words, especially through substituting letters and using the wild card tiles. You also learn about locked pieces, which must be used correctly to unleash more letters, and block letters that must be broken by having them spelled in a word, thus advancing you to the next level (you have to break all the blocks before you can advance). There are three modes of play in this game. The first two are single player modes: relaxed and action. Action mode is a timed game that has you spelling words and racing against the clock. This is a high pressure mode that gives a set time frame in which all of the blocked letters need to be broken. Wild cards and the wild bomb card are especially helpful in this mode because they help build larger words that help you advance to the next level faster. The untimed mode is a much more relaxed, play at your own pace, kind of game. In this mode there is no clock so you can focus on spelling larger words and building a strong score. In both of these modes there is a Tiki Totem on the right hand side of the display which grows as you spell words. The longer the word, the higher the totem rises. Once it reaches the top you are rewarded with bonus points and three wild cards which can be used to your liking. The third mode of play, which is really cool and unique for word games, is a “Mouse Party” multiplayer mode. This mode allows two or more player to play at the same time on the same computer in either a competition or a cooperative. It's titled Mouse party because in order to play you need to have multiple mouses that you plug into the same computer. This give both you and your partner a cursor that can be used to click letters and create words. The ability to switch between letters is a cool feature, but executing the maneuvers is more difficult than it's worth. Switching can be tricky and is very “touchy” with mouse clicking. You might be trying to spell a word and the game thinks you are wanting to switch letters or you might try to switch letters to no avail. This is frustrating and takes time to figure out. Another drawback of the game is having only one difficulty. This limits the game, making it too hard for some and not hard enough for others. Coral reefs are an element of this game that come out of no where and are poorly explained. Apparently, as you advance in levels, you earn and unlock fish and different coral reefs. This element is out of place and doesn't add anything to the game. You might not even feel a sense of accomplishment after unlocking fish because it is so out of the ordinary and not consistent with the rest of the game. The reefs and fish are not a drawback, but they do not bring anything substantial to Big Kahuna. Big Kahuna is a fun underwater game that has figured out a way to incorporate a multiplayer mode into the spelling genre. This makes the game stand apart from others with similar playability (Aqua words, Bookworm, etc...). Though there is only one difficulty setting, the ability to play three differing modes makes this a great game. This is for all spellers and for anyone interested in a cerebral challenge.